Could be that FROM THE FIRE (FTF) is one of the most underrated bands in rock-history. Unfortunately exactly at that moment, when the band released their AOR-debut ‘Thirty Days And Dirty Nights’ in 1992 on the Active Record label, American grunge was shoving a flannel-clad shoulder against melodic rock, and though the album got very favorable reviews in friendly circles, a sudden fascination with teen angst and the city of Seattle kept FTF at arm’s length from Stateside radio play or proper distribution. On the night in October 1992, at NYC’s Rocketeria, FTF performed what would be their last live show for over 20 years, to a packed house. A re-release in 2009 generated the first spark to talk about a possible re-union. The re-firing of the band would finally take place in 2013, when Sciotto, Kelly, and Lafferty converged on Sciotto’s upstate New York “Elliptical Sound” studio to record a follow-up effort, titled “Evil Men Do”, an album containing strong AOR and melodic rock elements again. 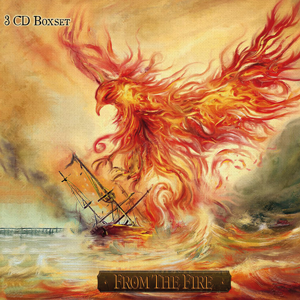 FTF presented the album live at the “Firefest”-festival in Nottingham/UK. The performance at this festival, accented greatly by the inclusion of bassist John McCoy, was extremely emotional – indeed, life-changing – for a band that had no idea what to expect, but who were greeted by a sold-out crowd that knew every word to their older songs, and were willing to embrace their new material. It was this enthusiasm, that inspired the last standing band members J.D.Kelly and Thommy Lafferty to produce the third album “OctOpus” – also a self-release of the band in 2016, due to the fact that a promised production of an indie label wasn’t delivered. As was the case with “Evil Men Do”, this special-edition set represents the first time “OctOpus” has seen a proper release.